At the time when leaders from all around the world assembled at the Swiss mountain town of Davos, some of the leading scientists, economists, educationists, and technology futurists foregathered at the oasis of Dubai to discuss the path of enhancing the performance of governments & ways to enrich the lives of citizens worldwide through technology. In the annual World Government Summit 2018, the Vice President of Dubai urged policymakers to make AI as an integral part of the government performs its functions. He also emphasized the need to carry out discussions to address climate change, biotechnology and space settlement. The agenda of the summit was how can leaders of tomorrow improve the lives of the next generation. Last year in 2017, Mohammed Bin Rashid Al Maktoum, the Vice President and Ruler of Dubai took a breathtaking initiative and launched a five-decade government plan within the UAE Cabinet. It was dubbed as “The UAE Centennial 2071 Project” which mostly covered plans on developing a lifestyle that promotes happiness and prosperity in the future. Also, the foundation to create Dubai as one of the most technologically adept cities in the world was laid in the following event. The Centennial plan for the year 2071 contained certain points which indicated that the future establishment of the world will require machines to be intellectually smart. Such machines will be capable to make critical decisions without any human interference so it can mitigate the human factor. It will provide the opportunity to individuals so they can start focusing towards other areas of professionalism such as achieving sustainability in business and developing soft skills. 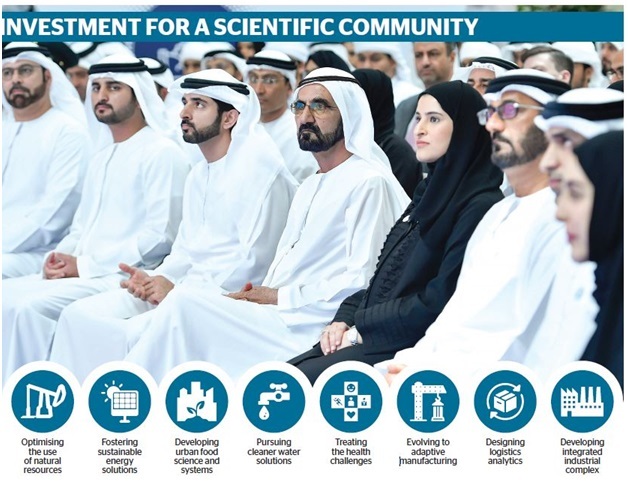 His Highness (the Vice President & Ruler of Dubai) announced that there are four key areas the future scientists of UAE will seek to develop themselves. It will seek to excel in the field of education, economy, government development and fostering cohesion in the community. Sci-tech is at the peak of its development in the UAE and one area where the capital state, Dubai, is looking forward to innovate is none other than artificial intelligence. By respecting the principles of the Emirati moral value systems, the future leaders of UAE want to create an environment which applies concepts of deep machine learning and moves the nation forward in the next age of advancement. The UAE government changed the tides of time by introducing the first ever minister for AI in the world. They believe that the endorsement of a young individual talent to govern and explore areas of Artificial Intelligence can open new doors to development in Dubai. At just the age of 27, Omar Sultan Al-Ulama is fueled to make marvelous discoveries in the world of AI and make the better use of them in improving. He is set to take action on a commendable strategy formulated by His Highness (Mohammed Bin Rashid Al Maktoum)where he aims to cut annual costs down by 50% using artificial intelligence. They are calling it the UAE’s 2031 AI Strategy. He has also previously entertained the government with his role as the Deputy Director of the Future Department and now Managing Director of the World Government Summit. Nobody likes to yell for orders or wait in the line so they can get served by an official who is energetically deprived and has some bad news already waiting. Omar Sultan believes that Artificial intelligence will mitigate the human element from such jobs allowing machines to make critical decisions on their behalf. However, his major concern is not the implementation of such technologies, but to create more job roles for individuals who are going to be affected, once technology supersedes their positions. Because when it does, there will be massive unemployment. This will not only create huge problems for the government of UAE, but it will also result in creating problems for the governments on a global scale as the individuals will seek out to return back to their own countries and show the willingness to be readjusted. His Excellency stated that they will ensure more job opportunities are created for the less privileged in other domains such as Social Media and Marketing. These jobs will include roles such as social media influencers, social media management, and community networking so they do not have to stay unemployed for a longer period of time. As far as the future generation is concerned, the government of UAE is taking multiple initiatives such as empowering the youth to learn how to code at a very nascent development stage. It is introducing software learning courses in early education institution curriculums so the early learners can adapt to it at a very young age. Another big challenge that Omar Sultan Al Ulama observes is how the teams are going to stay-up-to-date as the machines will learn on its own and develop briskly. Smart intelligent machines learn by interacting with social environments, collecting information, storing and processing it. Then, it delivers output based on what it has analyzed. Google’s AutoML is a great example of an intelligent bot which is now capable of making a decision on its own. It holds the power to create multiple child bots and train them for different applied situations accordingly. With such ever-changing environments in which AI-powered management systems operate, the need to update and regulate policies can become an extremely difficult task to achieve. Omar Sultan believes that artificial intelligence is something that needs to be democratized and the need is relevant where governments of the world should come together. UAE is transforming its landscape, cultures, business processes, infrastructures, and much more so it can compete with the rest of the elites from around the world. How is UAE government opting in to parallel with the rest of the world? Developed under the supervision of Sheikh Mohammed Bin Rashid Al Maktoum, Vice President and Prime Minister of the UAE has given birth to a long-term vision plan which extends as long as up to the year 2071. It is to come into effect after 2021 and will run up to 5 decades. The blueprints for the Centennial 2071 is projected to stabilizing government policies in order to retain Dubai’s country reputation across the world. The plan was based on the lecture presented by H. H. Sheikh Mohammed bin Zayed Al Nahyan, the Crown prince of Abu Dhabi and Deputy Supreme Commander of the UAE Armed Forces. In his discussion, he spoke about the respective strategies and their effective implementations which will guarantee development for decades. By the year 2021, UAE government is planning to remove the immigration officers and planning to replace them with AI intelligent smart terminals for safer assessments and better onboarding experiences. A great initiative to present AI-powered robocops becoming a part of the Dubai’s Police Force. An extract from The 4th Gulf Information Security Exhibition and Conference. 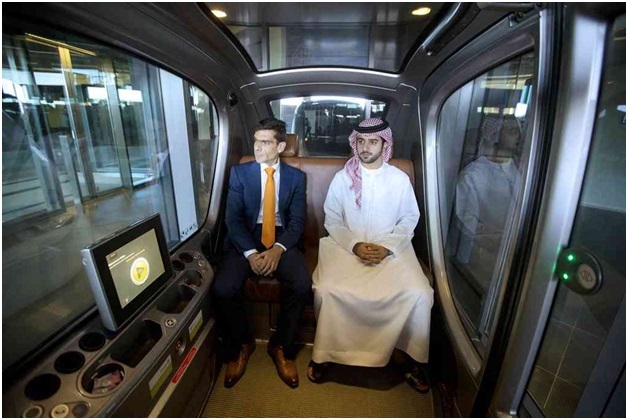 An inside view of a driverless vehicle navigating around the city of Masdar. To interact and specify locations, all you need to do is utilize the touch panel. 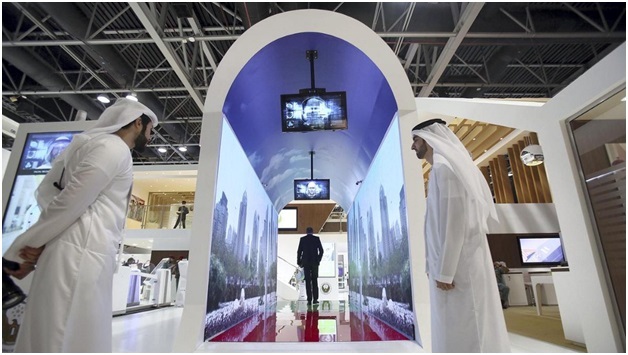 The UAE aims to establish the first inhabitable human settlement in Mars by 2117. H. H. Sheikh Mohammed bin Rashid said that the project is a seed that the UAE plants today and expects future generations to reap the benefits, driven by its passion to learn to unveil a new knowledge. He issued directives to Mohammed Bin Rashid Space Centre to lead the Mars 2117 project and prepare a 100-year plan for its implementation.